The allure of migratory fish in Great Lake’s Tributary Streams continues to grow in the fly fishing community. They are big fish that put a big bend in the rod. By all accounts, Great lakes Steelhead and salmon are trophy fish and provide anglers with opportunity for and addiction that will last a lifetime. While steelhead can provide and angler with their best days on the water they can equally provide the most frustrating. Our one-day seminar will provide you with an arsenal of tactics and hands-on experience to embark on epic steelhead adventures throughout the Great Lakes Region. How to read the water and identify holding areas as related to run timing. Various presentation methods for both 1-hand and 2-handed (spey/switch) rods, including indicator fishing, Contact / Euro Nymphing and swinging wet flies. Rods, flies and leader material will all be provided. You can bring your own rod(s) – a 9-foot, 8-wt single hand rod or 10-foot 7/8 switch rod is recommended. Polarized sunglasses are a must. Lunch is not provided so please bring one. A wading staff or walking stick is recommended for anglers that need assistance on steep river banks and very uneven/rocky stream bottoms. 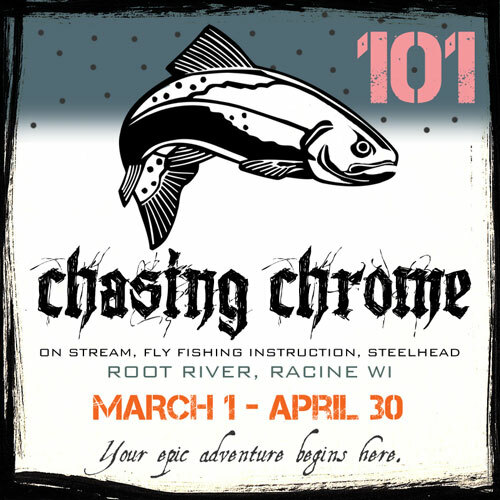 Classes are held on the Root River in Racine, Wisconsin because the run is thick, concentrated and occurs in relatively shallow water — which provides a great visual learning environment. The class runs from 10 a.m. to 5 p.m. Cost $250 for one person and $50 for each additional angler (maximum 3 anglers). $100 non-refundable deposit (can be used for any re-scheduled class). The steelhead class runs from March 1st through April 30th — call 815-341-9609 today, to reserve class space.